Looking to automatically log, keep track of, or enter your expenses? Keeping your books in order for tax season can be a challenge. Here's a few ways to manage your expenses automatically! Recurring expenses are expenses you incur on a month-to-month, year-to-year or other recurring basis for your business, such as your monthly Táve or photo proofing account subscription. In your Recurring Expenses Settings, you can quickly add a new recurring expense by giving it a payee, memo, amount, timeframe (monthly, yearly, every 3 months, etc.) and the next date this expense should be logged. Once you’ve set up the recurring expense, you’ll be notified each time Táve logs it in your account for you by email on the morning it's done. By adding expenses to your products, you can have expenses scheduled to post when they're due. This is a great way to log expenses associated with different products and services that you sell. You can specify an expense payee, category, and due date on the product editor. If you want to keep track of your expenses throughout the year, you can always see where you are by heading to the Expense Report. This report shows you all of your business expenses, sorted either by category or month that have been posted. 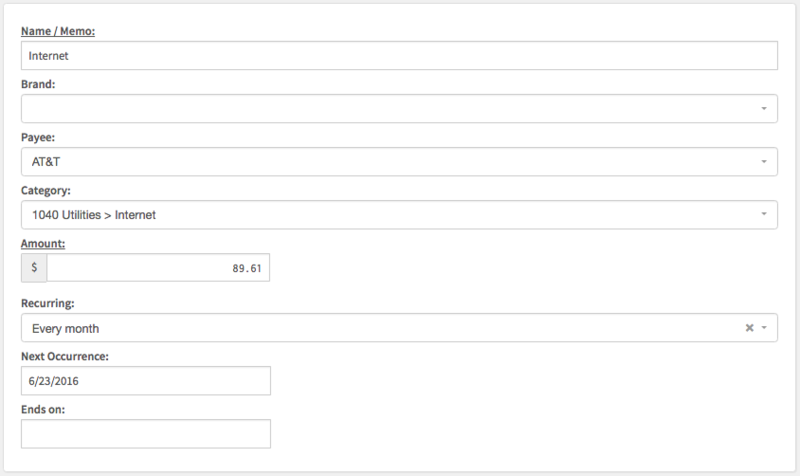 You can also filter this report by brand, payee, timeframe and expense category. 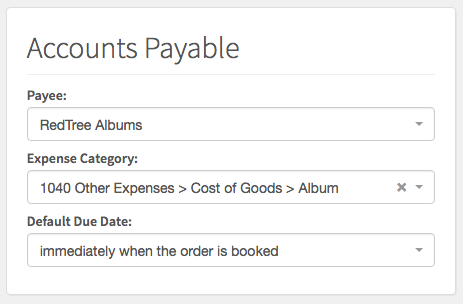 If you're looking to see your scheduled expenses, you can head to the Accounts Payable report from your reports page. If you have expenses that don't fit into either of the two automatic categories, you can log job expenses in 2 ways in Táve: from the dashboard and from within the Financials of any lead or job. All expenses logged in either way will also appear on your General Ledger and your Expense Report. When logging an expense right from the dashboard, you’ll set the payee, add the expense description, date, amount and expense category, followed by choosing the lead or job, if any, that you want it to be associated with from the drop down. On the Financials section of a lead or job, you will see all of the expenses you’ve incurred, and future scheduled expenses, related to the job. From this screen, you can also log a new expense, similar to the example shown above by selecting the Record Expense button. If you have a receipt associated with this expense that you'd like to upload, you can use the Upload Receipt option there to upload an existing receipt image or snap a photo of your receipt on your mobile device. In the event you'd like to use a third party software like Quickbooks, Xero, Wave, Freshbooks, or something else. You can always export out a CSV from your general ledger by clicking 'download' and import that into the software of your choosing.